Enterprises are looking to today’s most innovative technologies to tackle their biggest challenges. Robotic process automation, (RPA), brings automation to routine, information-intensive manual processes such as customer interaction, invoice data extraction and classification, claims management and contract verification. Expert System’s cognitive technology brings smart capabilities to RPA and extends automation to activities that require more intelligence. Cognitive automation offers additional advantages for cost savings and customer satisfaction thanks to natural language processing and text analytics. Because it understands text in a way that is similar to a human being, the cognitive Cogito technology brings human-level accuracy to the automation of your most repetitive and complex information-based processes. Cognitive automation is especially effective in banking and insurance for claims process automation. For insurance companies, replacing manual, error prone and cumbersome activities with software driven automation is no longer a luxury but a competitive requirement. Increased efficiency: Cognitive automation brings measurable ROI to claims processing automation. A human-like interpretation of claims content allows for quick and accurate processing; seamless extraction of the information agents need to assess a claim speeds up the approval process. Build on existing process: Cogito augments automation in each step of the claims validation process, from collecting the claim information and other supporting documents, to mapping the relevant information against the policy coverage DB. Cogito is easily integrated with your existing architecture. Faster, better decision making: Accurate, faster responses as a result of claims processing automation reduce the workload of policy holders and other organizations, resulting in fewer contested results and limited rework and legal costs. Cogito also helps simplify conflicting requirements when managing different types of benefits, and for changing regulatory compliance. By providing an accurate and flexible way to automatically access and extract the relevant information included in documents (such as claims, applications or other documents ) Cogito Discover enables cognitive automation of many information intensive enterprise processes. Today’s customers expect the flexibility to communicate with your organization at any time and from any device. Implementing multi-channel engagement that addresses the requirements of a digitally sophisticated, empowered and demanding public is a requirement for any modern organization. Expert System’s natural language based solutions for intuitive self-service address your customer requirements while providing greater efficiency for your support center and significant cost savings. An excellent automated customer support experience requires software that offers a clear understanding of the customer’s request—regardless of how they describe it—and simple, transparent integration with the CRM infrastructure and knowledge base to ensure access to the information customers need. 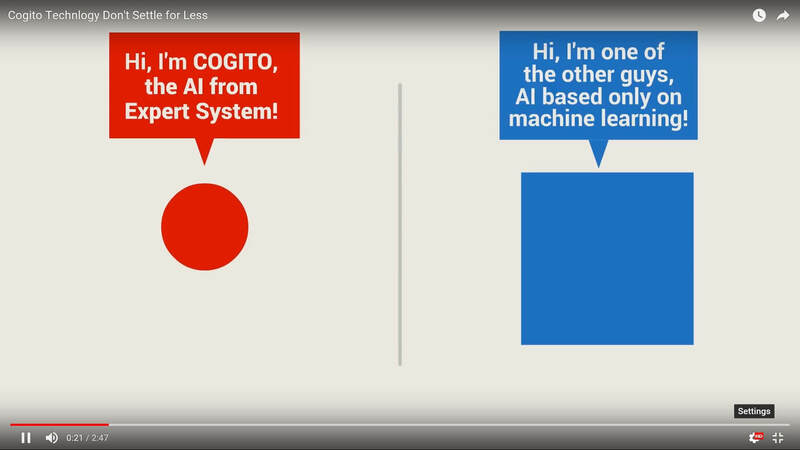 Cogito Answers understands language in the same way a customer support agent would. This allows cognitive automation of the support process, whether it is delivered directly to customers, or used to support call center agents. Understanding what the customer is saying also helps you understand how they feel about the issue, how important it is to them and what they think about your brand. Deploy this capability automatically via digital channels such as your call center to deliver both increased efficiency and the customer intelligence that can help you provide better products and services. Cogito Answers saved one customer more than $9 million by satisfying 23 million self-service inquiries, all via SMS.